The Apollo 11 flight is remembered as a giant leap for mankind, a moment when the world came together to watch Buzz Aldrin and Neil Armstrong hop, skip, and jump across the lunar surface. But the glamour and excitement of the moon landing overshadowed the more menial aspects of the eight-day flight mission surrounded it, days filled with NASA-mandated rest periods, science experiments, and, of course, eating. The food aboard Apollo 11 represented the height of late 1960s technology, as much as the Lunar Landing Module or the spacesuits worn on moonwalks. Tubes of apple sauce and stew were ditched for meals that could be heated by the astronauts and eaten with real silverware. 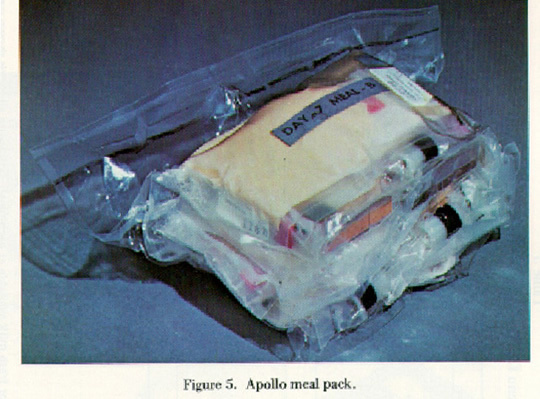 The Apollo crew even dined on thermo-stabilized cheddar cheese spread and hot dogs during the moon mission, bringing at least a bit of America in July to the sterile flight craft. And yes, there was bacon — foreshadowing the current bacon craze, the first meal eaten by man on the moon was none other than bacon cubes, coated with gelatin to combat crumbs. 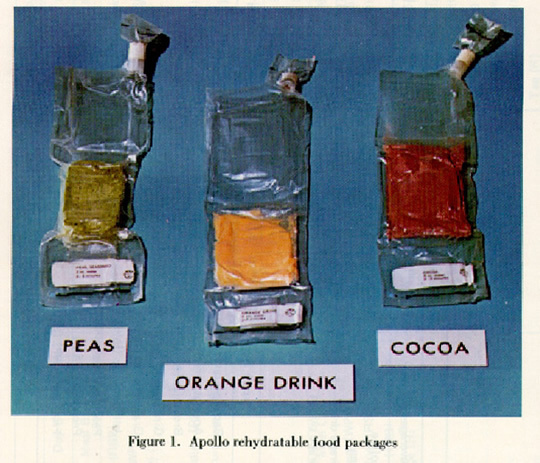 Apollo 11 food had to satisfy some major requirements we never have to worry about here on Earth. Pre-flight body weight had to be maintained, something that had proved mysteriously difficult on previous missions. 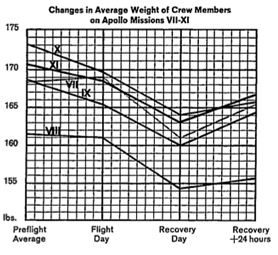 The graph, right from the Autumn 1969 edition (paid article) of the journal Nutrition Today, illustrates the dramatic weight loss suffered by Apollo astronauts. After crunching the numbers back home, NASA revealed that Buzz Aldrin had expended 300 calories an hour on the moon, an amount akin to an hour of light yard work or running after the kids. Not enough to worry about a severe weight loss, but add that amount to the stress and tension of being in space, and it's a small wonder that a main concern of dietary scientists was ensuring calorie-laden dinners. Of course, these miracle meals had to be lightweight, compact, and edible in zero gravity. This last point was essential: hamburger buns are still banned on space flights because of the crumb casualties that might result (which is why tortillas are so popular aboard the International Space Station). Until very recently, all drinks had to be sucked out of straws. Even the smallest drop of tomato juice had to be caught, in case it interfered with the craft in some way. Another less obvious problem with space food was what to do with it once served its purpose and left the astronauts' bodies. The pleasant euphemism NASA created for this is "low residue." The other unpleasant fact is that in-flight nausea and other "undesirable physiological responses" during earlier Apollo missions had been attributed to food. There's nothing worse in a cramped, stuffy space cabin than a fellow astronaut with "enhanced gastric awareness." To combat some of these difficulties, NASA scientists employed the "wet pack" food technology developed on Apollo 8. 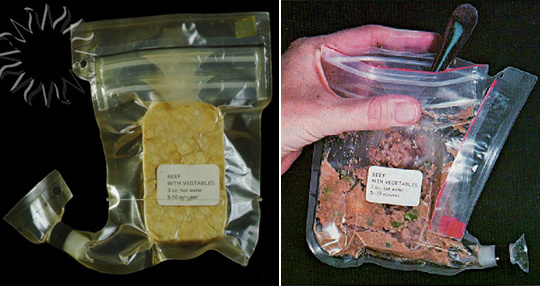 A wet pack allowed thermo-stabilized food to retain its moisture content, thereby saving astronauts valuable food prep time. It also allowed them to see and smell what they were eating, rendering Beef and Potatoes a bit more appetizing. A major improvement in food technology from the Apollo 11 mission was the spoon-bowl packet, allowing for food to be rehydrated and warmed in a pouch, which was then opened with a plastic zipper and eaten with a spoon. The moisture in the food made it cling to the spoon, even in a reduced-gravity environment. Sausage Patties, Pork With Scalloped Potatoes, and Chicken Stew were some of the delicacies packed in spoon-bowls and enjoyed by our guys in space during the Apollo 11 mission. Some of the most telling details about space appetites on Apollo 11 come from the beverage side of things. For the first time, coffee was brought up for the astronauts: fifteen cups for each man, with Aldrin requesting black, Michael Collins with sugar, and Neil Armstrong's light and sweet. Oddly enough, Tang, the orange-flavored drink powder associated so closely with the early space program, was not aboard Apollo 11. In First Man: The Life of Neil A. Armstrong, by James R Hansen, Adlrin said, "I can't speak for the other flights, but before ours, the three of us dutifully sampled the orange drink and instead chose an orange-grapefruit mixture as our citrus drink." Also MIA was that staple of science museum gift shops, astronaut ice cream. 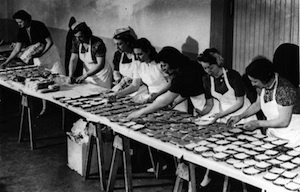 The astronauts settled instead on desserts like bite-sized brownies and pineapple cake. But how did the food taste? All of this spoon-bowl and wet pack talk leads us to ask the question, "How did it taste?" There's surprisingly little data about that. Dr. Malcolm Smith, the Chief of Food and Nutrition at NASA for the Apollo 11 flight, reported in the Autumn 1969 edition of Nutrition Today (paid article) that astronauts Armstrong, Aldrin, and Collins "enjoyed the food we had put aboard. The variety was satisfactory, and there was enough to satisfy their hunger and maintain their performance." Buzz Aldrin enjoyed the shrimp cocktail, explaining later that, "The shrimp were chosen one by one to be sure they would be tiny enough to squeeze out of the food packet, and they were delicious!" From First Man: The Life of Neil A. Armstrong we learn that Neil Armstrong's favorite meal was spaghetti with meat sauce, scalloped potatoes, fruitcake cubes, and grape punch, a spread that certainly sounds Retro Recipe ready. 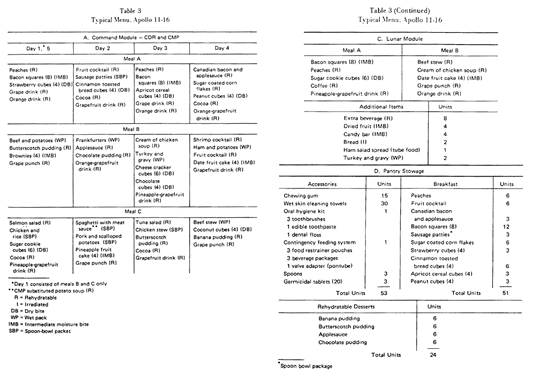 The 1974 case document (pdf) about Apollo food systems reveals the hard work and care that went into feeding astronauts. Thermo-stabilized hot dogs, packs of dehydrated chicken salad and the like were all the "result of the efforts of a large group of people of diverse backgrounds, interests, and skills." Each person in this group was "caught up in a desire to contribute to a glamourous, adventuresome, and authentic program of space exploration" during the Apollo missions. Food technology might seem like small space potatoes when compared to the intricacies of rocketry and climate control systems, but the physical and mental well-being of the astronauts, and by extension the success of the mission, depended on details as small as cheddar cheese spread and brownie bites. Video: NASA Apollo 11: Chicken Stew: "Delicious"
Video: Buzz Aldrin puts ham spread on a slice of bread. Thermo-stabilized cheddar cheese spread and hot dogs? Amazing. The crumb thing makes me think of that Simpsons where Homer has to eat the potato chips to save the mission. Real life! banned burger buns in space, buzz's shrimp cocktail, bacon cubes...this is brilliant.Thanks. I love that bacon was the first food eaten on the moon. Piiiigs iiiinnn Spaaace. James: So glad to see another "Pigs In Space" fan! Link Hogthrob 4eva. When are they going to send someone to walk on the moon again? It's been 40 years! Nifty. NASA historians bothered to preserve videos of what they ate but lost the original film of man landing on the moon. 400,000 scientists to launch a moon landing and not 1 to keep the original film! Stephanie Butler, I am in love with you for this. Thank you so much! Well done! Fantastic article. 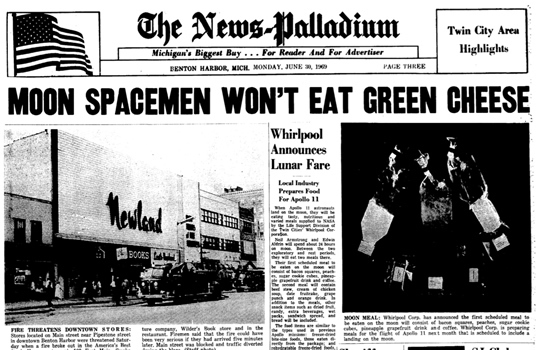 Answered every question I had about the food of the Apollo program.